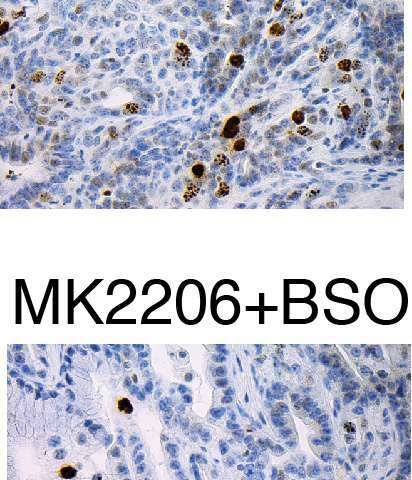 "Of course, that's exactly what we want cancer cells to do - to burn themselves out," observes Iok In Christine Chio, a postdoctoral investigator in the Tuveson lab who led experiments reported today in the journal Cell. "The therapeutic principle our lab is testing is whether, by increasing the level of oxidation in cancer cells, we can cause pre-malignant and malignant cells to die." When cells detect excessive oxidation, they literally commit suicide, following a built-in program called apoptosis. One way of increasing oxidation in cancer cells is to decrease levels of antioxidants in those same cells. A question addressed by Tuveson's team was how best to do this - and do it in a way that does not harm healthy cells. They focused on a protein called NRF2 (pronounced "nerf-2"). Scientists call it a master regulator of redox homeostasis - by which they mean that it's one of the switches one can tweak to disturb the exquisite balance between oxidation and reduction in cancer cells. When NRF2 is active, cells synthesize a chemical called glutathione, an important antioxidant. It makes sense, then, to try to reduce NRF2 activity or knock it out of action altogether. This is not possible, for two reasons. One is that it is a transcription factor - a protein that regulates the activity of other genes. Transcription factors are famously difficult to target with drugs. But "you probably wouldn't want to knock it out, in any case," says Chio, "because in addition to promoting production of glutathione, NRF2 has a role in regulating several hundred different genes." One can't delete it from a cell without impacting many other processes. Using a panel of pancreas organoids - spherical agglomerations of pancreas cells sampled from people with pancreatic cancer and from the healthy pancreas - they were able to observe what happens when NRF2 is completely eliminated. The test was run in normal, pre-malignant and malignant pancreas organoids. 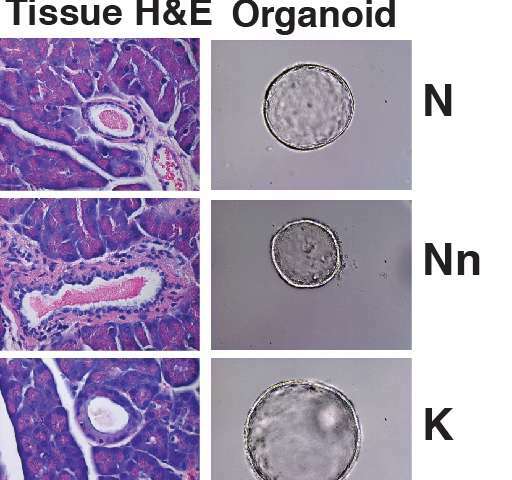 The pre-malignant organoids carried cellular mutations in the kras gene, which is aberrant in nearly all human pancreatic cancers. The malignant organoids bore that mutation plus a mutation that inactivated the powerful tumor suppressor gene p53. That mutation along with kras is seen in most human malignancies. These experiments provided a critical clue: The team saw that when NRF2 is missing, the machinery in cells that translates messages from genes into proteins - the process of protein synthesis—is very sensitive to fluctuations in the balance between oxidants and anti-oxidants. Crucially, however, protein synthesis was not impacted in normal pancreas cells. "We were very excited when we saw this, " Chio says. "This meant that if we could find a way of reducing antioxidants, protein synthesis would only be impacted in precancerous and malignant cells, a potentially powerful therapeutic strategy." AKT inhibitors, administered alone, have produced only modest survival benefits in both mouse models and human patients. "We hoped that by combining them with BSO we might generate a synergy that would boost its effectiveness," says Chio. In effect, the strategy was to mimic biochemically what would happen if they were able to knock out or reduce levels of NRF2 in cancer cells. It was the rationale for hitching BSO to the AKT inhibitor. "This is where our pancreas organoid system was so valuable," Chio says. "We were able to test this idea and see that this approach was synthetically lethal - it did increase the killing power of the AKT inhibitor, but the synergy was not present in the setting of normal pancreas cells," she says. In other words, normal pancreas cells were not harmed by the treatment. 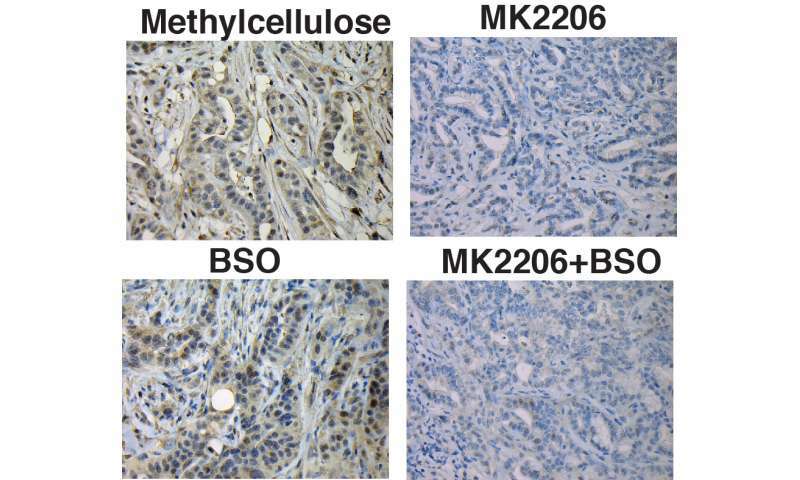 The team's new paper reports a synergistic effect in the mouse model of pancreas cancer, as well, proving the concept of killing more cancer by decreasing cancer cell antioxidant levels. Not fully satisfied with the survival benefit noted - comparatively small in the mice - they believe they can optimize the treatment by combining different combinations of translation inhibitors and repressors of antioxidant synthesis. This work is well under way. "Pancreatic cancer employs NRF2 as one of its henchmen to promote bad behavior, but the details were previously unclear," Dr. Tuveson says. "By developing organoid models, Christine, proteomics expert Darryl Pappin of CSHL and their collaborators pursued the basic biology of NRF2 to unravel the molecular underpinnings of this protein and thereby propose new therapeutic approaches for patients. We plan to translate Christine's findings to early phase clinical trials in the near future." More information: "NRF2 promotes tumor maintenance by modulating mRNA translation in pancreatic cancer" Cell July 28, 2016. This is what I hate about medical research! The same solution to preventing cancer becomes a promoter of cancer. This is why cancer research is so complicated to predict and control. The same goes for telomeres. Long telomeres help extend lifespan but also increase the risk of cancer development. NIPSZX, but diminishing antioxidants selectively in cancer cells is the major approach for killing cancer cells. The only antioxidant that throws a wrench in this approach is n-acetyl-l-cysteine as a precursor of glutathione.